I play around with HDR every so often, but it isn’t a regular part of my processing or shooting approach. I tent to use it to capture a wide dynamic range - leaving the final image looking ‘natural’. In this case, the DR was well within the capabilities of the camera – but the original image fell a bit flat. I used HDR Efex Pro to it gave it a lot more texture and I’m pleased with the result. 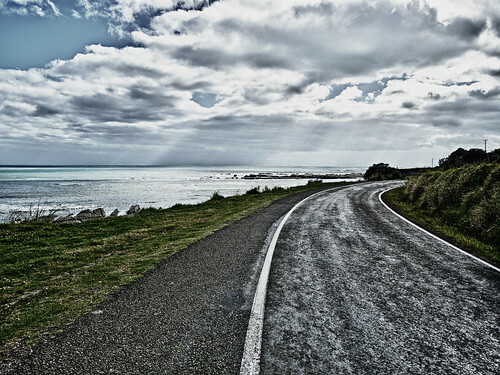 It was taken on a coastal road on the East Cape of the North Island – heading to the lighthouse that is the Eastern-most point in New Zealand. This entry was posted on Thursday, March 17th, 2011 at 8:28 pm. It is filed under Photography, POTD. You can follow any responses to this entry through the RSS 2.0 feed.